To better understand and appreciate the mysterious underground beauty found in Diamond Caverns, take a minute to explore the cave with a scientific viewpoint. Many scientific disciplines are brought to bear in “Speleology” (the study of caves). Let’s start with the two most prevalent scientific viewpoints. The story of Diamond Caverns is one of water, living things, and a vast amount of time. There are three major time periods in the story. First was when the limestone was laid down, second was when the cave passages were carved out by underground streams, and third was when all the beautiful calcite stalactites and stalagmites you see in Diamond Caverns formed, which is still happening today. Most of the rock you see in the cave is limestone, which formed in a warm, shallow sea. This happened so long ago that what is now Kentucky was not only under water, it was located south of the equator! The water was clear and harbored many living things, similar to the Great Barrier Reef of Australia today. How can this be you might ask? Well, all the continents slowly move. For example, Europe and North America move 1-2 inches farther apart every year, making the Atlantic Ocean just a little wider. Perhaps you have heard of the super-continent Pangea, back during the Age of Dinosaurs? When Pangea began to break up around 200 million years ago, the Atlantic Ocean was “born” in a sense, and of course it is still growing. These things take time. Some things about shallow tropical seas then and now are very similar: for instance, this is where limestone comes from. Corals, shellfish, and smaller sea creatures take dissolved calcium carbonate from the seawater to build protective shells. 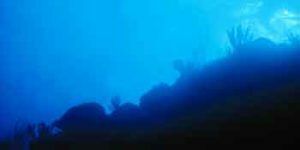 As these creatures die, their remains accumulate on the sea floor. Calcium carbonate that forms directly from the seawater also winds up on the sea floor, and geologists call it “ooze” since it is soft like slimy mud. Only the hard shells of animals like clams or corals are big enough to see, and we can still see them today in the walls of Diamond Caverns. Slowly, the ooze gets compressed into limestone. Slow. Let’s talk about slow. Based upon study of local limestone layers, geologists estimate that, on average, every foot of thickness we see today represents about 40,000 years. When you go into Diamond Caverns, look at how much limestone thickness you see. As you go down the entrance stairs, you are traveling back in time roughly 23,000 years for every step you take. The part of the cave we see on the tour is developed in about 100 feet of limestone, and at 40,000 years per foot, that means we are looking at about 4 million years of earth’s history during the Mississippian period in the walls of Diamond Caverns! Let’s fast forward to a time roughly 10 million years ago. With our limestone firmly in place, North America actually in the northern hemisphere, and above sea level, the stage is set for the cave to develop. In most parts of the world, runoff from rain flows mostly on the surface all the way to the ocean. In places with limestone bedrock, the water can take a shortcut through tiny cracks in the rock and emerge as a seep of water someplace lower down, often near a river. As the water slowly moves through the limestone, it dissolves a tiny amount of the rock, which makes the cracks a little bit bigger. The water can dissolve the limestone because raindrops pick up carbon dioxide as they fall from the sky, and even more as they soak into the soil. Soil contains a lot of carbon dioxide because of all the small animals, bacteria, and fungi that live in it. They, like us, take in oxygen and give off carbon dioxide. Water and carbon dioxide combine to make carbonic acid (as in carbonated soft drinks), which can dissolve the limestone. As the cracks carrying water gradually get dissolved out, they can carry more water, which means that they can be enlarged faster. Even so, geologists who study caves in the area estimate that it might take 50,000 years to dissolve away enough limestone to make a passage big enough to crawl into. When you walk into the tall, roomy canyon passages of Diamond Caverns, try to imagine how many crawlway-sized passages it would take to equal the size of Diamond Caverns, and you will get a rough idea of how long it took to make this cave passage! Imagine also how much water could flow through Diamond Caverns. What began as a trickle perhaps 10 million years ago became a major underground river by about 2-3 million years ago, and then a strange thing happened. The entire cave was filled with sediment! The filling of the cave was linked to the advance of continental glaciers that affected all the major rivers in North America directly or indirectly. Glaciers never reached the Diamond Caverns area, and so Green River was indirectly affected. In brief, higher water levels in the Mississippi River made it so that the Green River and its cave stream tributaries could not move sediment, and so it piled up. You can still see some of the gravels stuck high up in the ceiling of Diamond Caverns, and the shape of the tall canyon passage we travel through on the tour route was altered even while it was filled. How can we know this you might wonder? Look carefully at the limestone walls of the cave and you will find networks of interconnected channels that were dissolved out by water flowing between the sediment and the cave wall. We normally see these kinds of networks, called anatomoses, between bedding planes of limestone, but they can also form between sediment and walls. With another change in the cycle of advance and retreat of glaciers, the cave stream eventually washed out most of the gravel fill (obviously, or else we would not be able to walk through today!). We have seen that seawater can create limestone, and that freshwater can later dissolve the limestone to create caves. Well here’s another twist to the story: some of the same water that dissolves limestone can then redeposit it as the mineral calcite. Calcite is a crystalline form of calcium carbonate, which is mostly what limestone rock is made of. Okay, so what’s the difference between a rock and a mineral? A rock has different materials in it, sort of like a pizza that has cheese, mushrooms and pepperoni. A mineral has a definite crystal structure and so is made of only one material, somewhat like the pepperoni on the pizza. Getting back to Diamond Caverns, we know that rainwater gets carbon dioxide from that atmosphere and also from the soil as it soaks into the ground. And we know that the carbonic acid made by combining carbon dioxide and water can dissolve limestone. Now here’s the fun part: if the water stays in contact with the limestone long enough, then it will reach a point where it can dissolve no more limestone. When this water seeps into the cave, it can lose some of its carbon dioxide to the air in Diamond Caverns. This is similar to what happens when your soft drink goes flat after losing its fizz. Less carbon dioxide in the water means less carbonic acid, and so the water cannot keep as much dissolved limestone as before. So, some of the dissolved limestone crystallizes out as calcite on the ceiling, floor, and walls of Diamond Caverns. This can happen as a purely chemical reaction, but microbiologists who study caves have shown that bacteria are present on cave formations and may be involved in helping the calcite to crystallize. If the calcite deposits on the ceiling at a spot with an active drip, then a stalactite may form. Water dripping from the ceiling may form a stalagmite on the floor, and if water runs down an overhanging wall, then if may form a thin ribbon called a “drapery”. If the drapery is thin enough for light to shine through, and it is banded from changes in water chemistry as it grew, then it is called a “bacon formation” because that’s what it looks like. Diamond Caverns has excellent examples of bacon formations. If water seeps into the cave and evaporates at about the same rate as it seeps in, then “popcorn” can form. Of course it is made of calcite instead of corn. How long does it take a stalactite or stalagmite to form? Until recently we thought that it takes a century for a cubic inch to form. In a few cases this might accidentally be right, but usually it is wrong. Fact is the growth rate varies a lot, but in human terms it is slow. 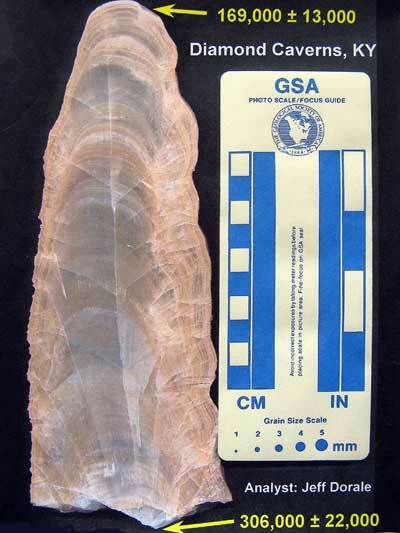 One stalagmite from Diamond Caverns has been studied by scientists who can actually date the calcite layers. This stalagmite is only about 9 inches tall, and yet the youngest part of it at the top is approximately 170,000 years old, and the bottom is roughly 306,000 years old. Based upon these dates, this stalagmite took 136,000 years to grow, and then it sat in the dark for 170,000 years until cave explorers first saw it! So, how long did it take for a cubic inch of this stalagmite to form? We know that it is 9 inches high, and let’s assume it has an average diameter of 3 inches. Recalling from geometry class some years ago, we know that the volume of a cylinder is Pi times the radius squared times the height of the cylinder right? OK, I cheated and looked it up on the Internet! If we square the radius (1.5 inches), we get 2.25. Then we multiply by Pi (3.14) and then the height of the stalagmite (9 inches) to arrive at a volume of 95 cubic inches. Because it took 136,000 years to form, we divide this by our volume of 95 cubic inches, and this tells us that a cubic inch of the stalagmite took about 1430 years or 14 centuries to form. As you can see, this is about 14 times slower than what is commonly assumed. A Geological Guide to Mammoth Cave National Park. Arthur N. Palmer. Zephyrus Press, Inc., Teaneck, New Jersey, 1981. Karst Hydrology: Concepts from the Mammoth Cave Area. William B. White and Elizabeth E. White, editors. Van Nostrand Reinhold, New York, 1989. It is July, it is really hot, and the whole family is in favor of cooling down for a while in a really nice cave. You are in luck because here’s a sign saying that Diamond Caverns is just ahead, and there is plenty of pretty stuff to see. Standing before the entrance, your guide begins to lead you down set of stairs that make the entrance easy for most people to descend. With each step down toward the spacious room below, you can feel the air get cooler until the temperature stabilizes in the mid to upper 50s. It feels like a drink of cool water on this scorching day, and everyone is glad to be in Diamond Caverns. Now here is something you may find interesting: if you come back in January when the snow is blowing and the fountain out front becomes a free form ice sculpture, then most of the cave will still be at the same temperature it was in the summer. In January of course, the cave will seem like a nice warm refuge from the bitter cold outside. It’s all relative as Einstein used to say! OK, Einstein didn’t say that, but it will seem warm in the cave during winter. Away from entrances where air flows into caves, the temperature is nearly constant and will change only a couple of degrees or less over the course of a year. This is because the surface of the earth is warmed and cooled with the seasons, and by the time the effects of all the hot and cold days penetrate down to the level of Diamond Caverns, the temperature has become averaged. When you run hot and cold water into the bathtub, a similar thing happens, and soon the water is all the same temperature. This relatively constant temperature makes caves a nice place to live for several kinds of cave life. In various places and times, caves have served as shelters for people to live in too, but today most of us choose to live in homes of our own design. In part this is because of how humid, moist, or even downright wet caves can be. We do not prefer to live in places with dripping water, but a lot of small animals do. The nearly constant temperature and wetness are perfect for the cave crickets and blind cave beetles your guide points out to you. The cave cricket shown at left has very long antennae and sensitive hairs on its tail end to help it safely navigate the cave in total darkness. The beetle at right has no eyes, and has very sensitive antennae to help it find cricket eggs buried in the sand. The two holes are where a beetle has started digging. These critters are superbly adapted to life in Diamond Caverns, and at this point your guide shows everyone the biggest challenge to life underground as she turns out the lights. Yikes! It is dark. Pitch dark. You try to see your hand in front of your face, and you can almost fool yourself into thinking you can see it move. But when someone else puts their hand in front and asks if it is moving or not, you realize that you can see absolutely nothing at all. Your guide asks the group to be as quiet as possible so you can all listen to the cave in its natural state. Everyone is surprisingly quiet, and other than the drips of water, there is no sound at all. No wind, no birds, no traffic, just darkness and near silence except for the sound of water slowly doing its work. This is what the cave was like for millions of years before explorers came in with lights. Ah, light. The guide has turned the lights back on and we can see once again. Clearly, the crickets and beetles must have some pretty amazing sensors to find their way in the cave. On the back end of cave crickets there are two little prongs called “cerci”, which are covered with tiny hairs. These hairs are very sensitive to air currents, and it is thought that sensing air movement helps them navigate to entrances where they can get outside to feed on the surface. Look also at the antennae on a cricket and see how long they are. The cricket can sit in one spot and sweep its antennae all around to check for other crickets (not generally a problem) or predators (big problem!). The cave orb weaver and the cave salamander both prey upon cave crickets as they commute from Diamond Caverns to the surface for meals and then back again to the relative safety of the cave. Predators. Let’s talk about predators. If you were a cricket, then the most dangerous place you can be is on the surface. Yet this is where you must go to find food. There are mice, snakes, and a lot of other predators waiting for you. Crickets leave the cave about once every ten to twelve days to find something to eat. They are not picky in terms of diet, which means that they will eat almost anything with some food value. Having found food, they return to the relative safety of the cave, but there are predators in the cave as well. In the darkness of the cave wait spiders called cave orb weavers because their web is round like an orb. Occasionally a cave cricket makes a wrong turn and winds up in the spider’s web. Spiders gotta eat too, you know. Another animal that preys on crickets is the cave salamander. It is more appealing to us since it is a pretty orange color with black spots, and it is not a spider. Most of us do not like spiders very much, but it is important to realize that they are a natural part of the terrestrial ecosystem in Diamond Caverns. What I am leading up to here is that all kinds of cave life should be watched and appreciated but left alone to live out their lives as they naturally would. Let’s get back to those cave crickets and beetles. There is a fundamental difference between these two animals: the crickets are able to visit the surface world on a limited basis at night when it is not too hot or cold, but these beetles have no eyes and are otherwise unprepared for the living on the surface. They are called “troglobites”, which means “cave dweller”; this is a name scientists coined for terrestrial critters found only in caves. Animals like the crickets that shelter in caves but feed on the surface are known as “trogloxenes”, which means “cave guest”. There are also some animals that can live out their lives in cave or surface habitats, and they are called “troglophiles”, which means “cave lover”. The cave salamander is a good example of a troglophile. Cave animals do not live in isolation. They are part of communities made up of different species, and the cave cricket is known as a “keystone species” because so many different kinds of cave animals rely upon it for food. We already talked about the spiders and salamanders that eat crickets, but what if I told you that the cave beetle also preys upon crickets? Because the beetles are so much smaller than the crickets, this might at first seem impossible. We could, I suppose, imagine beetles hunting crickets in packs like wolves, or like primitive humans bringing down a woolly mammoth, but it’s not quite that dramatic. Most of us have been on an Easter egg hunt, and this is how the beetles spend most of their lives, looking for cricket eggs, that is. The crickets do not make this easy. Their eggs are buried in sandy sediment in the cave, and the beetles must do their best to find where an egg might be. When they locate a likely spot, they must dig down in search of the hoped-for egg. The holes they dig are as deep as the beetles are long. Think of digging a hole as deep as you are tall every time you wanted something to eat, and you only found food once in a while. This will give us all a new appreciation for our refrigerators! When a beetle does find an egg, it is a bonanza because a cricket egg is nearly as big as a beetle. Off it goes with its grocery to a hiding place, often on the ceiling, where it can eat without getting into a battle with another beetle over the egg. Try to imagine carrying a watermelon as big as you are while climbing up a wall in pitch dark, and then cling upside down on the ceiling before you get to eat dinner. It does help to have six legs, but even so, these little beetles are pretty impressive. Besides eggs, there is another way that crickets serve as a keystone species. All critters must eat, and what goes in must come out, if you know what I mean. So, crickets go out of the cave and eat as much as they can hold, which is an incredible amount. They can consume more than their body weight in food. For me that would mean sitting down to a meal weighing more than 195 pounds! No wonder they don’t go back out to eat for over a week. Actually, the huge and infrequent meals are a way to minimize the risk of becoming someone else’s supper. Once safely back in the cave at a roosting spot, they hang on the ceiling where predators in the cave cannot easily get them, and digest their food. Just as all critters must eat, they must also poop, and this accumulates on the floor as a layer of guano. If ever you think that the food you get is not very good, then consider a diet of cricket guano for every meal. Hmm, that is food for thought. But there are a lot of interesting cave adapted animals who feed on this guano, and sometimes these animals are referred to as “guanobites”. As you might imagine, a thin layer of cricket guano on the cave floor cannot serve as a food supply for large animals, so most of them are pretty small. There is a cave adapted millipede that lives in Diamond Caverns, and the ones we find are up to an inch long. Then too, there are troglobitic insects called bristletails that are just as long overall, but built more delicately with long “feelers” on each end. Even though they are roughly the same size, their behavior is quite different. Like all millipedes, the ones in Diamond Caverns move quite slowly, which makes them easy to observe. In contrast, the bristletail often appears to be a critter on a mission as it scurries along the floor or up the wall of the cave. The millipede at left and the bristletail to the right both subsist on cave cricket guano. The two cave adapted snails at left are tiny – only about 1/8 of an inch long. 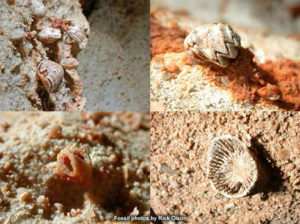 One of the same kind is riding on top of another cave adapted snail that could possibly be a new species. Both are sitting on top of a stalagmite in Diamond Caverns. The tiny blind cave beetle at left, about the size of a pinhead, is another consumer of cricket guano and whatever else might be available. At over an inch long, the much larger critter at right, called a forcipate dipluran, is a predator to be reckoned with if you are a tiny guanobite! Here are two more predators with different styles of hunting that are found in Diamond Caverns. The colorful webworm at left waits for an unsuspecting traveler to become entangled in its web (perish the thought! ), and the cave adapted daddy long-legs slowly goes in search of its next meal. From the beginning, water has been central to the development of Diamond Caverns, and it still is today. In addition to forming the cave and all the beautiful decorations, water flowing in from the surface carries organic matter into the cave, and this serves as the food supply for aquatic cave life. In a cave stream out beyond a passage called Sandy Crawl, we find crustaceans called isopods up to an inch long crawling on stones in the streambed and smaller crustaceans called amphipods scurrying along the bottom. Both species are fully cave adapted, and so are classified as “stygobites”. They are similar to the fully adapted terrestrial cave organisms we know as troglobites, but with the one major difference that they live in water. The isopod at left and the amphipod to the right are both fully cave adapted and so are called stygobites. Note that they have neither eyes nor pigment as a side effect of their becoming adapted to the food poor and lightless cave environment. These isopods and amphipods spend their days quietly munching on a thin film of microscopic life on the surfaces of the rocks and on the organic matter washed into the cave. Quiet that is, until a cave crayfish shows up! The crayfish grow to be more than 100 times bigger than the isopods or amphipods, and they’ll eat either at any opportunity. Put on your imagination cap, picture an enormous creature armed with crushing pincers, and you will understand why isopods are most often found on the undersides of rocks in spaces too small for crayfish. 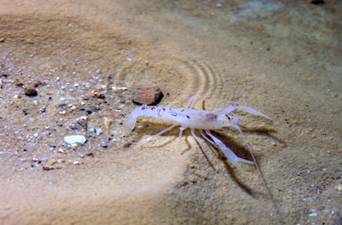 The amphipods apparently rely upon evasive action to avoid becoming a snack for a crayfish. Here is a young crayfish only about an inch long found in a pool along the tour trail. Like the other crustaceans we’ve talked about, the crayfish found in Diamond Caverns are stygobites and cannot survive in surface streams. Their pincers and whole body is slimmer than their surface cousins, and they live a long time, perhaps as much as a century! There are no fish at the passage levels Diamond Caverns has been explored to, but just 150 feet below and a bit to the west there certainly are. To get an idea of how close this is, the Diamond Caverns gift shop and museum building is about 150 feet long. So when you are in the cave, try to imagine that distance down through the rock. At this level runs a large underground stream known as Hawkins River. 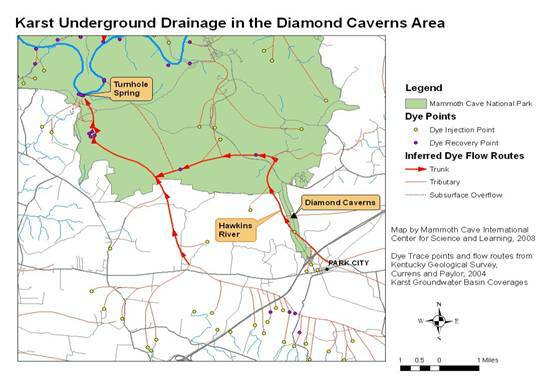 Water from Diamond Caverns and the local area drain down into this major underground stream shown in red on the map. The water from Hawkins River flows into another underground stream, and ultimately joins Green River at Turnhole Spring. In Hawkins River, there are blind cave fish and occasionally a partially cave adapted fish known as the cave spring fish. The Southern cave fish at left is the most common species found in Hawkins River and the Northern cave fish to the right is rarely found here, being most common downstream closer to Green River. Both are fully cave adapted stygobites and live much longer than surface fish of comparable size. There are many other kinds of living things in Diamond Caverns, some so small that they are difficult to photograph. But I hope that this cave life “sampler” has kindled for you an interest and appreciation of life in caves. The glass object shown in the photo is an artificial fissure similar to an “ant farm”. This “beetle farm or hotel” is in Sandy Crawl in Diamond Caverns as part of an experiment to learn where blind cave beetles raise their young. 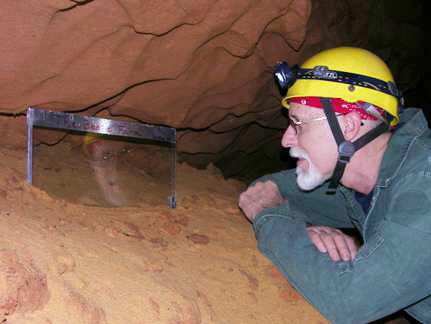 Rick Olson is the ecologist at Mammoth Cave National Park. Over the past 15 years has focused on ecological restoration in park caves, forests, prairies, and rivers. He is a fellow of the Cave Research Foundation and the National Speleological Society, has written many papers on cave ecosystem management and restoration, and contributed to four books on caves and karst.